Dragon Evolution of Eevee, very little is known about it. It's said that, on the rare times Eevee evolve into this pokemon, they go insane because of the sudden increase in power and how much is given 2 them. However, if it's owned by a person (which is even more unlikely as very few humans know they exist) they might have a chance because they'd have someone 2 help them. not many can figure out how this pokemon grows. Though it is and Eevee evolution, it's about 3 times as big as the others (with the exception of Ghouleon) the glove on it's tail is the size of most of their heads. the crystals on it's back and tail shed every year and grow bigger once they grow back. This is actually how it was discovered. Someone found the crystals and took them 2 a lab. The scientists were stumped and the crystals were ignored for the longest time. Eventually an Eevee found them and wouldn't give them up. The trainer thought nothing of it and the professor said he could keep them. The trainer only trained in the day, hoping 4 an Espeon. 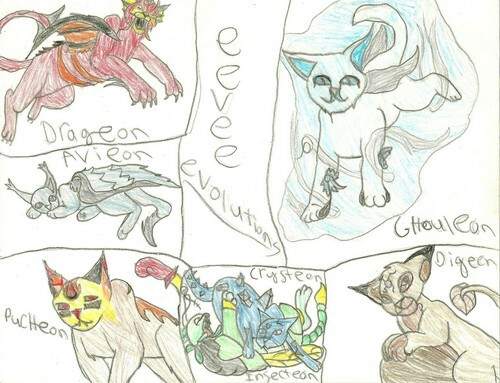 But, when Eevee did evolve, it was into a Crysteon. The only way 2 get a Crysteon is 2 train an Eevee like u want an Espeon only holding a shed gem from a Crysteon.